A leading sports broadcast network was in dire need of a monetization solution for its audio content. Their popular podcasts and audio live streams were managed with two separate systems, and the network sensed there might be a better way to manage and monetize their digital audio more effectively. To fully capitalize their passionate audiences and unify workflows across media types, the network wanted a single platform that could handle all of their digital content, regardless of format. That’s when the sports network turned to WideOrbit. Read our new case study to learn how one of the leading sports broadcast networks uses WideOrbit Digital Audio Suite to manage campaigns, easily target listeners, and streamline complicated transactions with top national advertisers. 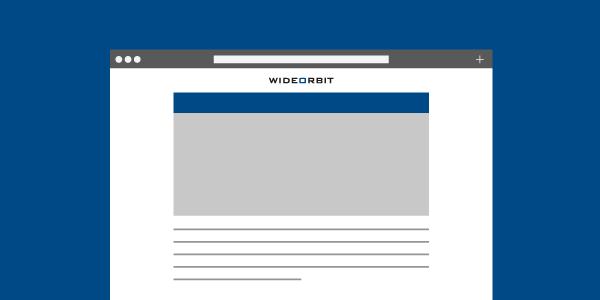 WideOrbit Digital Audio Suite makes it simple to manage and monetize podcasts and audio live streams, all from one platform. Learn what it can do for your company today.